New Government policy announced yesterday could affect an A27 bypass at Arundel. Draft policy text for the Government’s national planning policy was published yesterday and includes guidance on building over ancient woodland. All three bypass options for Arundel – including the ‘online’ solution – go through ancient woodland. Click here to read more about the three route options released by Highways England. The wording, which will be put up for consultation, was released on behalf of the Ministry of Housing, Communities and Local Government. It says: “Development resulting in the loss or deterioration of irreplaceable habitats (such as ancient woodland) should be refused, unless there are wholly exceptional reasons and a suitable mitigation strategy exists. The key here will be if Highways England is able to demonstrate any Arundel A27 solution satisfies the ‘wholly exceptional reasons’ and ‘suitable mitigation strategy’ criteria. Click here to read the consultation text in full, scrolling to point 173. Beccy Speight, chief executive of the Woodland Trust, said: “At last! The Government’s decision to amend planning policy to robustly – finally – protect ancient woodland is great news, and not before time. “The proposed change will make the words on ancient woodland protection contained in the recent 25 year plan for the environment a reality. Nick Herbert, MP for Arundel and South Downs, said: “The draft policy makes it clear that nationally significant infrastructure such as the Arundel bypass can go ahead even at the cost of some woodland, provided the benefit outweighs the loss and there is mitigation. “I am confident that an offline bypass will be approved because it is so clearly needed. 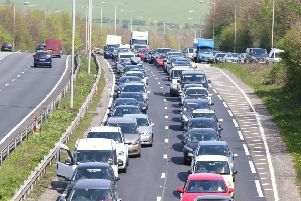 The environment is currently being damaged by congestion at Arundel which causes rat-running through the historic town and the South Downs National Park”. What do you think of the news? Email michael.drummond@jpress.co.uk or comment on our Facebook posts. Want to join the A27 discussion? Join our Future of the A27 Facebook group.